I’ve decided to switch phone companies as I was with Telus and just bought a new Iphone and Rogers is the only company that provides a phone deal. I think I have enough minutes at 450 and 500 Mb data coverage with all the other little stuff. It’s always strange having a number for so long then changing it. I have to think of everyone that I have to contact now. Been thinking about a new Apple Laptop? June 12, 2009 jazzicianLeave a Comment on Been thinking about a new Apple Laptop? Soho Computers in Victoria now has a clearance section on their web page and has some dandy prices on laptops that aren’t brand brand new but otherwise exactly as new. Go look at http://sohoservices.com/?p=522 to go directly to the “clearance” section or just to sohoservices.com to check out their website. I managed to strip the threads of my old bar ends. They were the standard bar ends that were slightly curved plain bars that attached on the end of the handlebars and allowed a rider to hold on to them while doing a standing climb up a hill. Problem is that it generally took you out of optimum position by having you move your hands up or forward away from the handlebar. This meant that my back was in a bad position, my wrist were bent incorrectly tiring my arms, back and my weight over the down stroke of the pedal was in efficient. Anyhoo, I went looking for a new one and found these ones. These new ones are great as my wrists are in a good position and keeps my weight well over the pedals as well as the grips are contoured to my hands. My back is happier too as I’m not reaching as much anymore, as I was with my old bars. They are $20 or so but come strongly recommended. I picked up a new set of tires lately. I had some tires that had quite an aggressive tread on it which was really good if I was off-road all the time but I often find myself doing 60 + km bike rides and the tires just weren’t good for that type of riding. I went to my bike Sugar-daddies at the Trek Store in Victoria and got some cross country tires. The tires that I got were the Kenda Karma L3R Pros. These are great tires for on-road riding and mud/ hard packed riding. I haven’t ridden on loose gravel. There were complaints that the side walls were too thin but I think that was one thing that I liked about it for my style of riding as I can put up the pressure to 80 psi (I usually have mine at 65 or so) and it is very firm, but the sidewalls flex if I hit a bump but only at harder hits. I’ve noticed a huge difference in my energy levels post rides in that I’m not too tired and can ride a lot faster and longer so it’s really good for me. I’ve done some off roading and downhill/rock climbing and really like what I’ve experienced so far. These are Kevlar tires and I have some super aggressive Kevlar 2.5 ” tires that are super easy to switch if I’m going up to the Hartland Dump or something like that so good to have a backup . Great tires for the intended riding. I’ve just installed some 7″ disc brakes. 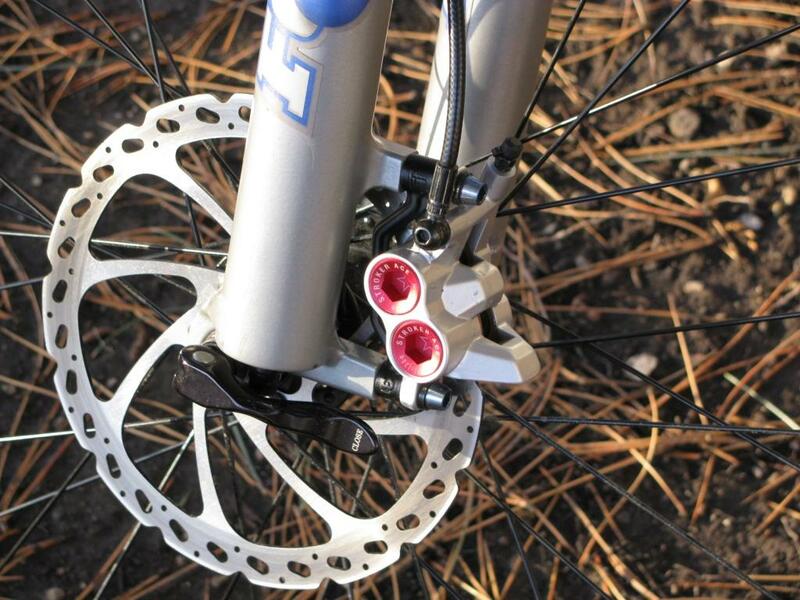 I had a thought that maybe I would like to get the hydraulic brakes, that uses hydraulic pressure as opposed to cables, but opted to get the Avid BB7 mechanical disc brakes and would recommend them to anyone. They are very efficient brakes in the dry or wet weather. One recommendation from the bike dealer was the importance of keeping the discs clean. Often things like grease and oil can get on the disc and get on the brake pad and it can be very difficult to clean. So each ride I wipe down my brake disc when I get home. It takes two seconds (margin of error of 1 minute) with a clean cloth and some plain-jane Isopropyl alcohol.